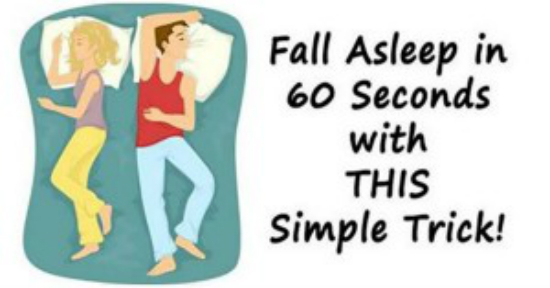 Home Unlabelled Powerful Trick To Help You Fall A Sleep In Just One Minute! Lots of people struggle to fall asleep and this can cause many ailments and reduced productivity. It can be very tiring. Average people need six to eight hours of sleep during the night so they can work normally, have enough energy and support the organism’s optimal function. Sleeping less can cause irregular heartbeat, heart attack, heart disease, stroke, heart failure and high blood pressure. But, fortunately, there is a great and natural solution for this problem. This is a breathing technique called ‘4-7-8’ which helps you fall asleep in no time. It was developed by Dr. A. Weil. It is very easy and simple to follow as it is a combination of meditation and breathing techniques that reduce the stress. You need to breathe through the nose for four seconds, then hold for seven seconds and in the end, release the air for eight seconds. Just do this three times and you’ll fall asleep. That is it! It is very easy and it will relax the body and calm the heart.